An illustration of what happens to the ion crystal when it is EIT cooled. For simplicity, only the ions in the centre row of the crystal are shown, but one should imagine an ion at every intersection in the lattice. Initially, the crystal is bending up and down like a vibrating drumhead. This is one example of a drumhead mode. Then, the researchers apply the cooling lasers (red lines). Due to the alignment of the lasers, the direction of the cooling is perpendicular to the crystal plane, parallel to the direction of the drumhead motion. After the cooling the amplitude of the drumhead motion of the crystal is very small and in the figure it is depicted as nearly flat. Credit: Jordan et al. Researchers have been trying to cool macroscopic mechanical oscillators down to their ground state for several decades. Nonetheless, past studies have merely attained the cooling of a few selected vibrational modes of such oscillators. A team of researchers at the National Institute of Standards and Technology (NIST) and the University of Colorado Boulder has recently carried out a study investigating the near ground-state cooling of two-dimensional (2-D) trapped-ion crystals with over 100 ions. The success of their cooling experiment lays the groundwork for improved quantum simulations and sensing with 2-D arrays of hundreds of ions trapped inside a Penning trap. Penning traps are devices that can store charged particles by applying a strong magnetic field. These devices can control crystals of tens to hundreds of ions, a quality that makes them versatile quantum simulators. In their study, the researchers at NIST and UC Boulder succeeded in cooling all the 'drumhead' modes of a thin 2-D crystal with over 150 beryllium (Be+) ions, stored inside a Penning trap. "We used Doppler laser cooling to cool the ions close to the Doppler cooling limit. At these low temperatures, the ions naturally form a Coulomb crystal," Elena Jordan, one of the researchers who carried out the study, told Phys.org. "A crystal with N ions has 3N motional modes. The 2N modes are in the crystal plane and look like whirls or distortions, N modes are perpendicular to the crystal plane and look like drumhead modes. For quantum simulations, we couple these drumhead modes to the ions' spins." The researchers observed that dropping the temperature of drumhead modes below the Doppler limit could enhance quantum simulations of 2-D spin models. They hence set out to implement an efficient sub-Doppler cooling technique, which would allow them to cool the ions to the lowest possible temperature. "Recently, Regina Lechner et al. at the University of Innsbruck, Austria, cooled linear strings of 18 ions with electromagnetically induced transparency (EIT) cooling," Jordan said. "This encouraged us to think about applying this technique to two dimensional systems with hundreds of ions." Inspired by past research carried out at the University of Innsbruck, Jordan and her colleagues Athreya Shankar, Arghavan Safavi-Naini and Murray Holland at JILA begun to theoretically study the possibility of EIT cooling all the drumhead modes of a 2-D ion crystal that is rotating inside a Penning trap. They soon found out that existing theory was insufficient to describe the cooling process of this system and thus begun developing new models. "Athreya developed new theory models and ran simulations that showed that cooling of all the drumhead modes should be possible without changing the experimental parameters for the cooling, that means that no frequency shifts or laser power variations should be required," Jordan explained. "Surprisingly, theory predicts that cooling of a multi-ions crystal should be faster than cooling of a single ion. Our results encouraged us to implement EIT cooling and the experiments later showed that the cooling not only works very well in the simulations, but also in our real Penning trap." The experiment outlined in the study was carried out by Jordan alongside her colleagues Kevin Gilmore, Justin Bohnet and John Bollinger, in their lab at NIST. Beryllium ions were confined along the axis of their Penning trap by a static electric field, as well as by a strong magnetic field (4.5 T), parallel to the trap axis. The ions' motion in the magnetic field leads to a Lorentz force, causing the ions to rotate in the trap, while remaining radially confined. "For EIT cooling, we used two lasers to couple the atomic states in Beryllium in a way that leads to quantum interference and creates a so called 'dark state' that does not couple to the lasers and can be used for EIT cooling," Jordan explained. "The two beams come in from the side at an angle of ±10 degrees with respect to the crystal plane." A cut through the Penning trap used by the researchers, with laser beams for cooling and temperature measurement. Credit: Jordan et al. The rotation of ions in the Penning trap causes a time varying Doppler shift of the laser frequencies. To attain efficient cooling despite this Doppler shift, the researchers detuned the lasers from the atomic resonance larger than the maximal Doppler shift and adjusted the laser powers so that the EIT cooling condition could be fulfilled. They measured the temperature of the ions using an additional pair of laser beams, which coupled the spins of the ions to their drumhead motion. This coupling leads to a spin de-phasing signal that can be measured and used to extract the ions' temperature. "After 200 micro seconds of EIT cooling all the drumhead modes of the ion crystal are cooled close to the ground state, as we can see by comparing the experimental data to the theory model," Jordan said. "The cooling is as efficient as the theory predicted and cooling of all the drumhead modes is achieved without changing the experimental parameters." The experiment carried out by Jordan and her colleagues yielded remarkable results, confirming their theoretical predictions. The cooling rate measured by them was faster than that predicted by single particle theory, but was consistent with a quantum many-body calculation. "The results of our study are important from both a fundamental as well as practical viewpoint," Athreya Shankar, another researcher involved in the study, told Phys.org. "From a fundamental perspective, cooling mechanical oscillators close to their quantum ground state has been actively pursued for three decades now. While several experiments have succeeded in cooling one or a few motional modes close to the ground state, simultaneously cooling many modes of a medium or large sized oscillator has remained a challenge. By cooling all the drumhead modes of large ion crystals close to their quantum ground state, we have prepared a mesoscopic trapped ion oscillator whose motion has been nearly frozen to the extent fundamentally allowed by quantum mechanics." According to Athreya, the study carried out by him and his colleagues could also have important practical implications. EIT cooling turns their trapped ion crystal into an improved platform for quantum simulations and sensing, significantly reducing the background thermal motion that typically hinders the performance of science protocols. 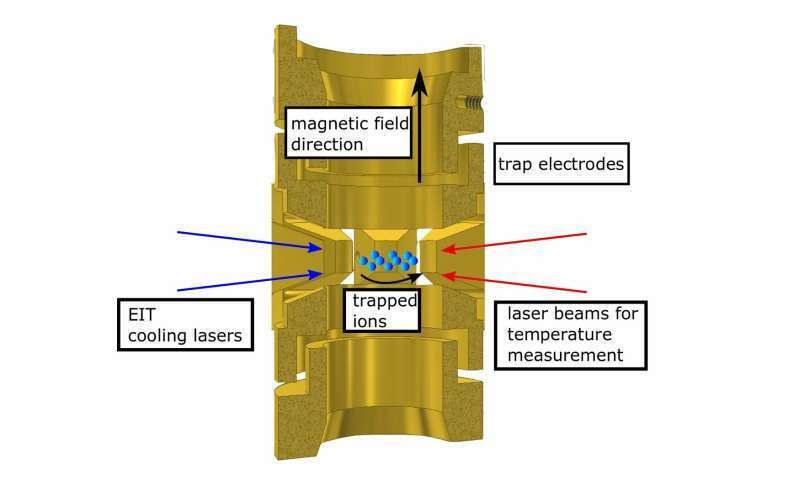 "The success of our experiment shows that EIT cooling is a robust technique that is not just limited to one or a few ions in a trap," Athreya explained. "The success of the technique with hundreds of ions in a challenging setting like the Penning trap is an encouraging indication that large ion crystals in other trapped ion experiments could also possibly be efficiently cooled and used for probing fundamental and many-body quantum physics." The researchers are currently working on using their ion crystal as a sensitive detector for electric fields. Very weak electric fields can be produced by some dark matter candidates, such as hidden photons and axions, hence their apparatus could aid in the search for dark matter. "We will also get back to engineering interactions between our ions to simulate complicated physics in the lab that is difficult or impossible to model on a classical (non-quantum) computer—so-called 'quantum simulation'," Gilmore told Phys.org. "In both pursuits, EIT cooling will play an important role for us. For the electric field sensing experiment we use the motion of the ions caused by the electric forces exerted on them to make our measurement." Ions have thermal motion, which depends on their temperature, and this can be a source of noise in experiments. The researchers found that EIT cooling can reduce this background signal caused by thermal motion, enhancing and simplifying measurements. In a prior study, the researchers successfully detected weak electric fields using a method similar to that used for their temperature measurement. In the future, the same apparatus could be used to detect even weaker electric fields, as well as potentially to search for new physics. "Quantum simulation style experiments also benefit from this reduced thermal noise," Gilmore explained. "Such experiments rely on producing fragile quantum correlations, or links, between the ions. These links can be disrupted or destroyed by thermal motion, which degrades the quality of the simulation. So again, getting to lower temperatures is helpful."